Did you just move into a new place? Or perhaps you are settled in your home but ready for a change of style. It can be challenging to plan a space from scratch, but it’s also a great opportunity. For better or worse, Steve and I have moved a lot over the years, and on the “better” side, I’ve gotten a lot of experience designing spaces. Though I could have transferred our furniture and look directly from home to home, I used each move as an opportunity to refine our collection and re-consider our style. Of course, each home had its unique features of architecture, layout, and lighting, and adapting to each of these became an opportunity to try something new. I like to look at magazines and online – Pinterest is perfect for this – and collect images of rooms I like. I start by collecting everything that catches my eye, and then I will edit the collection and look for common themes. Once I have a collection of images that I like, I try to summarize the look in words, defining the color scheme and style. Having the style summarized helps keep me focused when I start decorating. I like to add elements bit-by-bit, to help me see how everything will fit together. I’ll often revise my plans as I go. Don’t rush, or you may end up buying a lot of cheaper items to stay within your budget instead of focusing on slowly acquiring quality pieces. Use what you have! I’ve had a lot of success re-using furniture in new ways. Sometimes it’s as simple as changing the purpose of a piece of furniture. For example, we used this bedroom dresser as a dining room sideboard for a while, and more recently, I switched to using a former TV stand as our side board. Other times, you can repaint or reupholster an item to give it a new look. For example, I spent quite some time looking for black dining chairs with architectural lines, only to realize that I could repaint our existing dining chairs, and by adding a whimsical chinoiserie fabric to the seats, they fit in perfect with our new look. While most rooms work best with an overall vision and cohesive style, the unique and unexpected touches are what make a room feel complete. This could be an accent of an bright color or modern art displayed in a traditional room. To make your room feel personal and warm, It’s also important to make sure that you use a mix of new and old items in a room, so your home doesn’t feel like they came straight out of a catalog. I like to find vintage furniture on craigslist like this wooden chest or our marble top coffee table. I’ve also found a lot of great vintage picture frames and ceramics at local thrift stores. A fun room to demonstrate this process is our living-dining room. The style I honed in on for this room was based on a Hollywood Regency mid-century look. The main colors are silver/grey and blue. 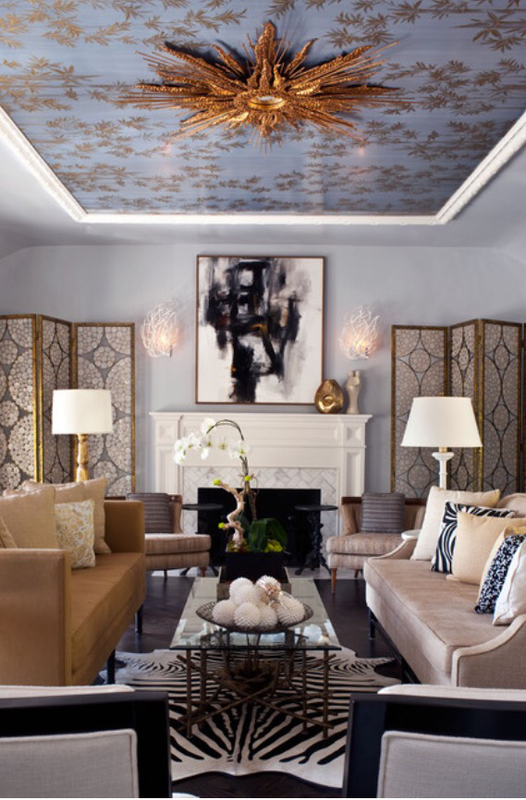 One of my favorite inspiration rooms is this one, by designer Elizabeth Gordon. I love the clean-lined feminine upholstered pieces, with touches of metallic glamor. While I am well on the way to creating our dream living room, my rooms are never really done. I’m always tweaking things and looking for ways to change things around. 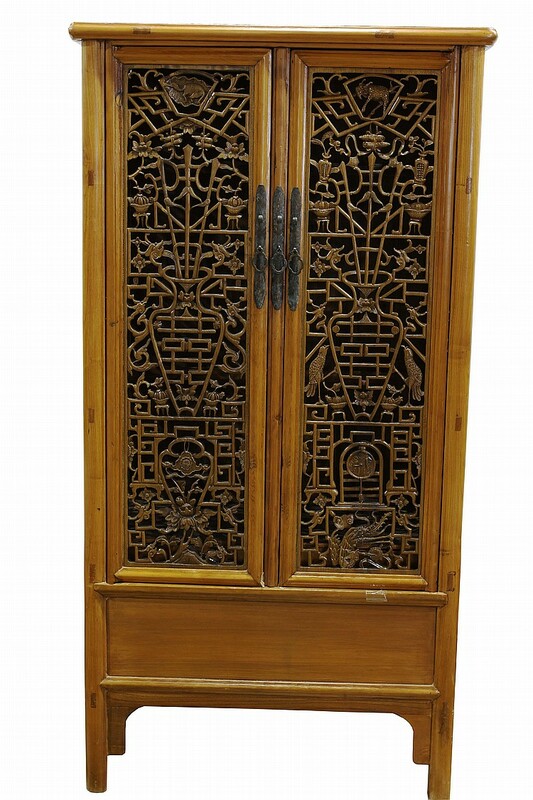 One piece I have an eye on is this Chinese cabinet from the online auction site invaluable.com. They have a variety of fine art for sale, including paintings and sculptures that would make a great jumping off point for your inspired space! The folks over at invaluable inspired me to write this post, and I have big ideas for a cabinet like this. I would like to turn this into a bar cabinet, by adding mirrors to the inside and displaying glasses and bottles. The doors would keep clutter hidden, but the screens would allow glimpses of the glass and bottles on the inside. I think it would be a spectacular addition. I hope I will be able to do this project soon and show it to you!